Maria Montessori believed that the development of the individual begins at birth, if not before. Infants are immediately born into the First Plane of Development that Dr. Montessori defined by an absorbent mind, the acquisition of language, intense concentration, the development of self as well as biological and physical independence. These tendencies are often most apparent during the first year to year and a half of life as it is so easy to observe the babies’ absorption of the world around them since they don’t yet have the distraction of words. We see language come slowly, haltingly, but surely. We see the young infant deep in concentration rocking back and forth determined to roll. We see the older infant begin to mimic those around him revealing that he has been closely watching and examining his world and those in it. And most notably, we see the infant move through the first year of life, away from the comfort, immobility and complete dependence of the womb into a walking, crawling, eating, child that begins to yearn for independence. It is a miraculous and beautiful transformation; one that is fostered and encouraged by the Montessori Method. Our Infant House is a unique environment designed entirely for the infant. It is a small environment with a maximum of 8 babies. The atmosphere is intended to feel warm, cozy, and safe for the infant, but within a regulated, predictable, school environment for the convenience and comfort of the parent. The constant basis of our Infant House is to provide a nurturing and loving place where children are encouraged to grow and develop at their own pace. It is also intended to be a place for parents to feel secure and welcome, and involved. We understand the privilege that parents grant us in being a part of this special time in a child’s life. The Montessori Infant curriculum is entirely child centered and plays to the tendencies of the infant. The room is safe and secure, allowing each child to explore freely and to engage in movement. Infants in a Montessori setting are not confined to high chairs and other immobilizing devices. They are provided equipment at their own level that allows them to observe and absorb their surroundings. The environment is quiet and peaceful as infants listen to classical music, the sounds of nature, or the reading voices of their teachers. Stimulation is thoughtfully prepared and provided slowly and with focus. Montessori materials are introduced as the child becomes ready. Lessons are intended to facilitate the major milestones of the first year and a half of life. They include, but are not limited to rolling, crawling, object permanence, talking, weaning, walking, etc. Language development is a central focus of the Infant House. Our teachers read frequently from a mixture of picture and board books as well as classics of children’s literature like Charlotte’s Web and Little Women providing exposure to language usage, word formation, and new vocabulary. They encourage babbling and describe actions, pictures, and sing songs ensuring the infant is exposed to different facial movements and expressions. Nursery gyms with ramps and stairs are available to encourage movement and play. Rugs and blankets of different textures are available to encourage sensory exploration. 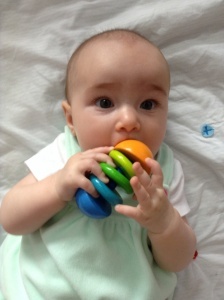 Developmental toys like puzzles and blocks become available as the infant requires more stimulation. The infants explore basic musical instruments and begin to experiment with art materials. Older infants are introduced to the basic of self-care and clean up routines. They work on pouring, sponging, sweeping, dusting, and even begin the basics of toilet learning. For the most part, the Infant House is the infant’s world, but at times the infant enjoys watching and exploring older children. The infants will be given opportunities to watch and observe the Toddlers and even the Children’s House students from the safety of their classrooms or with their teachers. Elementary students may visit and read to the babies. As infants become fully mobile and more communicative, they become free to explore the adjacent toddler classroom. At times, older children may be given the privilege to help the infants in tiny ways, allowing the infant the opportunity to see the possibilities of his or her growth. Infants generally spend at least one year in the Infant House and with the changing of the school year, move into our Toddler House. Full year, full day only. No academic year or half day options available.